Empirical – Observe using five senses (sight, sound, smell, taste, touch). Gifted at seeing reality—what is. Conceptual – Imagine by visualizing or employing the “sixth sense”/intuition. Specialists at envisioning possibilities—what could be. Animate – Process information on a personal basis. Make decisions based on personal, subjective values, with an emphasis on how people involved will be impacted. Inanimate – Process information on an impersonal basis. Make decisions based on an impersonal, objective approach, with an emphasis on using sound logic, grounded in issues. Every person uses all four of these mental functions, being strongest in one perception function and one thought function. Of these two mental functions, however, there is one with which each individual is innately most adept. This is referred to as the primary function. Though nobody fully understands precisely how the marvelous human brain performs all the tasks that it does, advances in modern science are constantly opening up new windows for us to gain clarity. These advances in the hard sciences provide the basis and the framework for understanding what the brain does, even if we still do not understand how or why it does those things. Brain Types is the first methodology to explain the brain’s orderly and logical impact on behavior and performance. Function dominance is no exception. Here is how it works. While the combination of mental functions for each Brain Type (EA, EI, CA, CI) is directly correlated with the region of the motor cortex in which that Type is most adept, the function with which each Type is most adept has to do with the most prevalent quadrant of the brain in which each Type resides. This chart depicts each quadrant of the brain, along with the mental function dyad in which Brain Types of that quadrant are primarily dominant. The other mental function of a given Brain Type—the one that does not appear in the quadrant—is the supplementary (supporting) function, meaning it is the one that ranks second in strength for that Brain Type. For example, consider the #13 FCIR Brain Type. As an FR Type, it is found in Q1—the quadrant that specializes in “Conceiving—via what is (E) or what could be (C).” Therefore, the primary function of the FCIR is its Conceptual mental function. Inanimate “thinking” is the supplementary function of the FCIR. 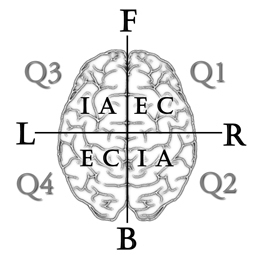 If we were going to continue ranking the functions, it would naturally follow that the tertiary function would be Animate “feeling”—the opposite of Inanimate, and the least adept function of the FCIR would be the (Back-brained) Empirical function, located in the FCIR’s weakest quadrant—Left posterior Q4. Remember that wherever a Type is strongest, the converse must logically represent where that Type is weakest. Looking at the chart, we can clearly see that either Empirical (E) or Conceptual (C) are the dominant functions for the Q1 Types and because FCIR contains a “C,” Conceptual is primary. 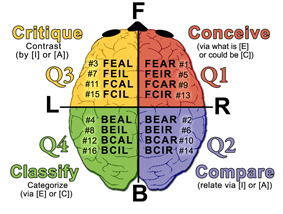 Moving back to Q2, remember that this quadrant is focused on “Comparing—via I or A.” It makes sense, then, that the Brain Types found in Q2 (BR), have either Inanimate or Animate as their primary function. Q3 Types specialize in “Critiquing—contrasting via I or A,” so Q3 Types also have either Inanimate or Animate primary functions. Finally, Q4 is the quad that is expert in “Classifying—categorizing via E or C,” which means that all of the Q4 Brain Types are either primary Conceptuals or Empiricals. There is one final aspect of Function Dominance that makes sense only through understanding the intricacies of Brain Types. It is natural that energy-expending Front-brainers (Types who are typically outward-looking and “extraverted”) would readily display their primary function to the external world. Their supplementary function is the one they use when they are looking inward, reflecting, more in the back of the brain. Once again, this is perfectly logical, because whatever quadrant in which a Brain Type is found, the other quad of that same hemisphere is the one to which that Type can most easily transition. Going back to our example above (and you can look at the chart to more easily visualize this), FCIRs, who reside in Q1, naturally show the world their Conceptual function. When FCIRs slow down and reflect, they readily move to the back of the brain in the same (Right) hemisphere to Q2, where they access their supplementary function—Inanimate “thinking.” If you happen to be in their presence when this reflection occurs, you will likely witness another side of their persona. Conversely, all Back-brainers—regardless of which hemisphere (R or L) dominance—need to “move” out of their (back quad) comfort zone and into the easiest front quad (that of the same hemisphere) in order to readily interact with the external world. Therefore, it follows that Back-brainers are often known by those around them for their supplementary function, as opposed to their primary function, which is being used more readily within their posterior introspective capacities. The #8 BEIL Brain Type, for example, would, of course, reside in Q4 (BL). As a Type that specializes in “Classifying—via E or C,” the BEIL possesses a primary Empirical function. However, this primary dominance resides in the Back of the brain where the BEIL is most innately adept. The BEIL is more apt to show and deal with the external world using its supplementary Inanimate function, found in the Front quadrant of the same hemisphere—Q3. Why is this? It is neurologically essential, due to the fact that these external-dealing functions are found in the Front brain. This may make BEILs appear quite similar to #7 FEILs (Q3), who also display to the world their Inanimate function, due to the I’s inherent dominance in the FEIL’s natural Front quadrant. Do not be misled. Coming to quick decisions by the Inanimate function is much more valued and implemented by FEILs than BEILs. Conversely, BEILs prefer gathering Empirical data and making a final decision sometime in the future—after they have accumulated sufficient evidence. It is important to keep in mind that this material is greatly simplified to aid with proper understanding. As stated numerous times, every person uses all of their functions, both outwardly and inwardly to various degrees. When “pressure” mounts, however, in whatever form, that is when each individual relies on the strengths of his or her inherent Brain Type to behave and perform. By knowing the proficiency order of your mental functions, you can more clearly see and comprehend the areas in which you must focus in order to strive for balance in the way that you operate. Likewise, this knowledge will provide you with increased empathy and understanding as you encounter various situations involving others.